Everybody’s talking about it. It’s called Zenbo, and it’s the cutest little robot for home use you could ever dream of that just made its debut at the Computex trade show in Taipei, Taiwan. While it can’t do your laundry, cook your meals or run errands for you, it can still scoot around and perform smart tasks for you like turning devices on and off, play movies, make video calls and recognize family members all with an expressive look on its face. It’s actually the eyes that are expressive. Either way, what it boils down to is one darn cute personal assistant on wheels. The manufacturer behind Zenbo is an electronics company called ASUS. They designed the product to compete with other A.I. products, but they wanted to build theirs with an edge. Sure, we’ve got Siri, Alexa, Cortana and now Viv, but all they do is sit somewhere and dispense information or perform tasks from a stationary position. Zenbo, much like a Roomba, can zip on over and give you that adorable little cartoon face while rattling off a recipe or take music requests and still control the surrounding environment without missing a beat. 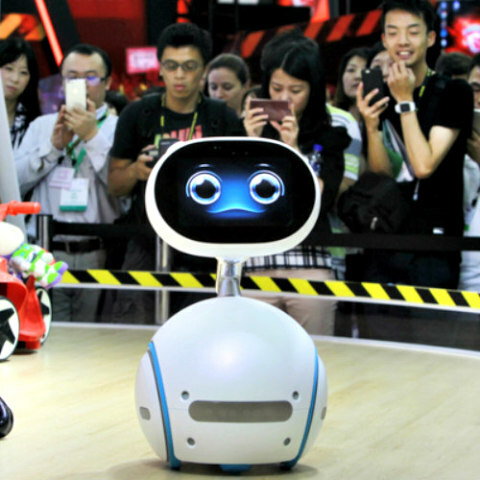 Also unlike the others, Zenbo has been programmed with entertainment protocols for children such as story telling, playing games, singing songs and purportedly even dancing. It can also help the elderly or disabled with the ability to remind people of their medication schedules and upcoming doctor appointments in addition to monitoring a home for emergencies like slip and falls. If an emergency does arise, Zenbo can not only notify the appropriate parties, but they will be able to remotely guide him through the use of a camera to the site of the problem. For some reason, scientists and inventors are convinced we all want robots. Besides having them do everything for us like little mechanical slaves so we can get even more inept at physical and computational skills, they can soon take our jobs, just like SoftBank’s Pepper taking orders from customers at Pizza Hut. But that’s what they believe. According to ASUS chairman, Jonney Shih, “For decades, humans have dreamed of owning such a companion: one that is smart, dear to our hearts, and always at our disposal. Our ambition is to enable robotic computing for every household.” At the current SRP of just under $600, he could be right. There are already a number of systems developed with controlling your immediate environment in mind, like Kasia, the smart home system app that allows you to inexpensively turn smart devices on and off remotely. Kasia also has what’s being called “smart presence” that allows your home to “react to you” as you move through it via the use of BLE tags that perform like motion detectors. Like Zenbo, all of this stuff is programmable and designed to make our lives easier and more comfortable. The next thing they need to invent is a robot that can terrorize us into getting off the couch to actually do something for ourselves on our own.